Summer is drawing close and with it more changes for random roleplaying. First major opportunity for something new (and why not old too?) 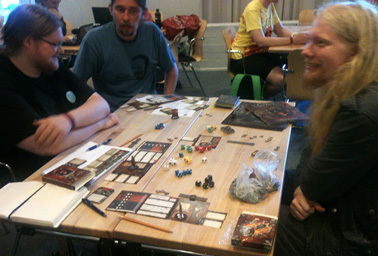 is Ropecon, Finnish roleplaying convention. Unlike earlier it takes place during May and kicks the summer on quite nicely. 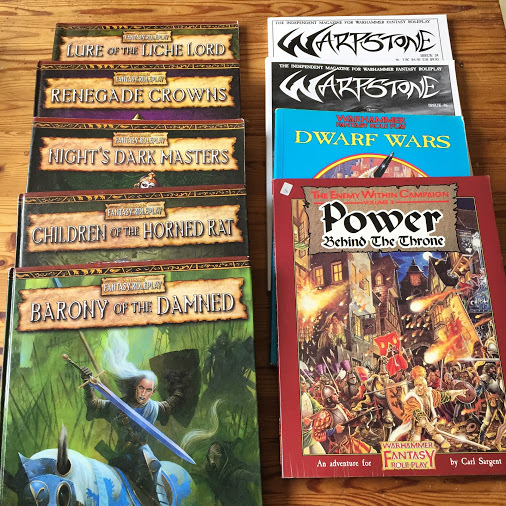 To prepare for Ropecon I went through my rpg collection and came into to conclusion I might want to sell some of my WFRP books. Checking their prices at Ebay I quickly noticed I’m sitting on a fortune. At the same time I know I won’t probably ever use most of them and really want to use all of them. I had almost lost hope in Zweihänder getting finished (don’t ask me why). So I was really pleasantly surprised when I noticed that there was a new “Wilderness Travel” section to be read. It clearly draws some influence from The One Ring travelling system as well as the same system for Dungeon World. But standing on the shoulders of giants is a great place to be. I like these rules and am really hopeful that we will eventually return to Bretonnia once I can get my hands on a published Zweihänder book. In other news: During next weekend the annual Finnish roleplaying convention RopeCon is held in Helsinki. I’ll be heading there and will write about my experiences on Guild Redemund’s Blog. Check it out if you are interested and give me a shout if you are coming to Ropecon. I’m always eager to meet new gamers! Happy summer and gaming for all! It is time to back my dice and head to Ropecon. Last year I got to play some WFRP3 and hopefully this year I can bash some mutant heads again! Maybe I even get a chance to GM my new adventure Tin Pint. I am not big on personal blogging. Or blogging of any kind for that matter. But after last weekends role-playing convention (Ropecon, held in Helsinki here in Finland) I felt I have to get a couple of things out. For the past (almost) twenty years I have played through a lot of games. When we started with Finnish translations from Lord of the Rings and Cyberpunk I would have never dreamed about a community as meaningful as Warhammer has. It is true that in those days there was not even internet but that is besides the point. In the tender age of fifteen I was introduced to the world of Warhammer Fantasy Roleplay and I was completely enthralled by it immediately. It was not long until I had purchased my very first English rpg and was game mastering ridiculous adventures for my friends. During that time, almost fifteen years ago, I found that there were people sharing their experiences with Warhammer online. That was something completely new to me. Then for some reason or another I decided to join A WFRP forum. Now I checked my joining date from the Strike to Stun forum. I could have sworn it was there where I was hooked to the community, but it seems I’ve registered there during our third “back to WFRP” campaign at 2006. It matters little as this however was the point where I can actually say I’ve been playing Warhammer and not just some fantasy rpg. Earlier our games run by me were high fantasy adventures with little or nothing to do with the Old World. But the immediate response to my question was one of the best feelings I’ve had during my years as GM. After that I’ve been running all editions of WFRP (along side of other games) but one thing has always been a part of my life. I am proud to admit that I am addicted to Warhammer forums. It is actually quite funny. We have not played a single game of WFRP in over a year but I still visit both FFG and StS forum on daily basis. In most days a lot more than once. I love to give to the community as I feel that the community has given so much for me. With no other game have I ever witnessed as open forums as with Warhammer. There is always something new and still familiar online. All in all the meaning of this post was to give a big thank you for all you out there. Even though we are not playing Warhammer currently I just know we will get back to it someday and it is mainly because of the community. I would especially like to give a lucky charm for Gotthart von Wittgenstein who answered my question on StS forum six years ago and to G. van der Vegt who ran a succesful game of WFRP3 in Ropecon and managed to blow some more light to a dying ember of my Warhammer enthusiasm. May the dice always favor you all.